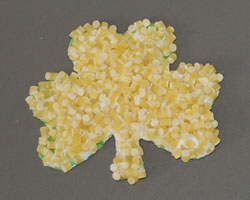 This shamrock pasta craft is decorated with tiny pieces of pasta. The look is really pretty. It has a beautiful texture to it, and these pins are easy enough for a child to make. This makes a cute school project for St. Patrick’s Day! 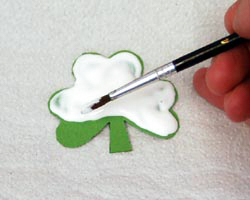 The shamrock can be made into a pin, a magnet, or a larger one would make a cute door decoration. 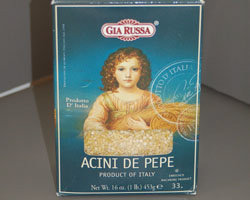 The dried pasta I used was called acini de pepe, and is found in the Italian section of the grocery store. 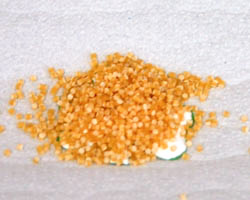 Couscous may also be used. 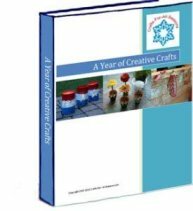 Read on to learn how to make this cute craft. 1. Begin by clicking here to open up a PDF document of the shamrock template, and print it out on the green card stock. Or, draw your own. 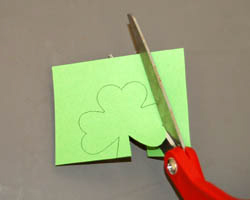 Note: The glue and pasta will make the entire shamrock more sturdy once it is dried, so card stock is all that is necessary. 2. Cut out the shape from the card stock using scissors. 3. Apply a liberal amount of tacky glue to the entire surface, and spread it all around with a paintbrush. Make sure the entire side is covered. 4. Drop the pasta on top of the glue and cover it completely. Use more than you need, because once it is dry you will shake off the excess. Then, push down on the surface of the shamrock and pasta with your hand to push the pasta into the glue well. Let this dry completely. 5. When it is dry, shake off the excess pasta. Pick away any pasta that extends past the outline of the shamrock. This part is very important. Use a toothpick or a pin to help you. If you don’t eliminate the extra pasta sticking beyond the edges you won’t get a clean looking shamrock shape. 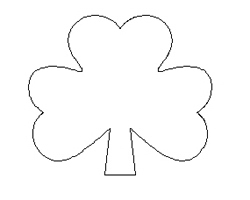 A good way to see if you have done well is to flip the shamrock shape over. Make sure you cannot see any pasta extending over the edges, if you do, pick them off one by one. 6. 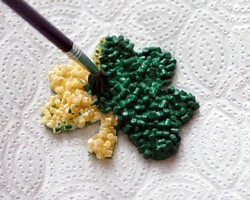 Put a good amount of green paint on your paintbrush, and paint the entire shamrock. Make sure you get all the pasta colored by tapping the brush up and down inside all the nooks and crannies. Allow this to dry completely. 7. 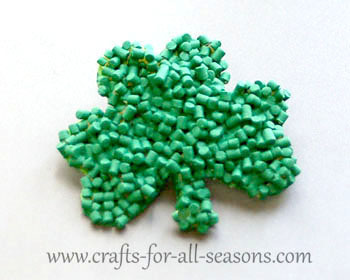 If desired, you can then spray your shamrock with a glitter spray paint or a clear acrylic sealing coat spray. 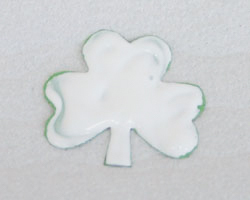 Glue on a pin backing or magnet and your shamrock pasta craft is finished!